I’m 16 weeks along! I had planned on writing and blogging more, but I’ve struggled with feeling poorly a lot the past few weeks. I’ve just had to take most days minute by minute, not getting discouraged by my limitations. It’s easy to become discouraged, and I feel frustrated so often. But I’m learning to give each feeling of pain, discomfort, inadequacy, and fear to God. He knows all that I do not, and nothing is too hard for Him! God could heal me this very instant if He wanted to, but I know He is teaching and guiding me through these waters. I need to be paying attention to where I am right now, and not where I desire to be. Hoping is critical for recovery, and I need to be better about not feeling hopeless. My belly has certainly grown since the beginning of week 16, probably due to a growth spurt that baby is experiencing! I had some very light spotting and very light cramping toward the end of week 16, which I think is just due to my ever growing uterus. It scared me at first! Catherine (my midwife/ ND) said not to worry about the spotting, so I’m trying not to think about it! I’ve also been extra tired and a little more hungry, which may also be due to baby’s growth spurt. 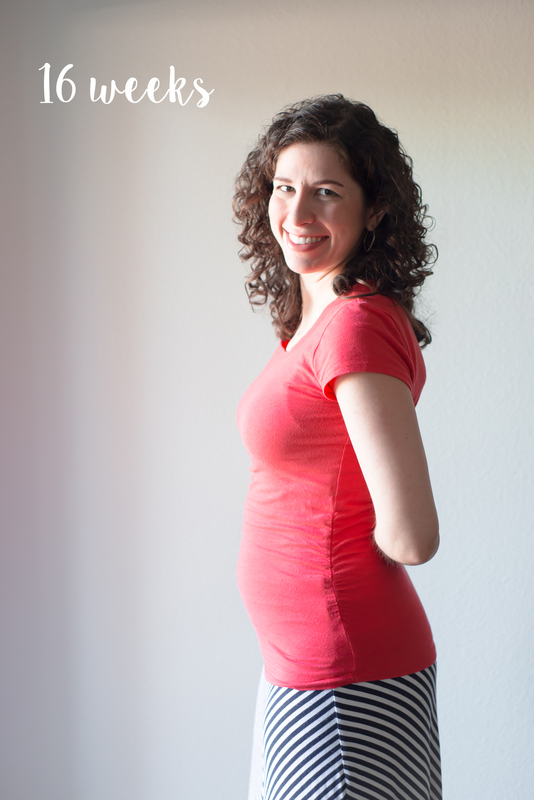 On a much happier note, I’m pretty sure I’ve been able to feel the baby move since week 14! I typically have to be laying on my back and very still, but there are tiny flutters every now and then. They put a big smile on my face and make me even more excited to meet this little person! I woke up Saturday morning and realized that I actually have a firm little bump now- not just a pudgy tummy! It seemed to happen overnight, which made me laugh, but I’m certainly not complaining. Now if only we could get these terrible stomach issues figured out! They’re only getting worse with baby starting to push up more and more on my insides. So, the sooner the better. But we’re so thankful baby seems to be doing well and had a strong heartbeat at our last midwife appointment! It was around around 160 bpm. Not only that, but we get to find out if we’ll be welcoming a little miss or mister into our home in just about a month! I’m still definitely thinking it’s a girl, but time will tell.